Athulathmudali who created them to salvage education from the monopoly of the privileged class and bring learning within the grasp of the poor. 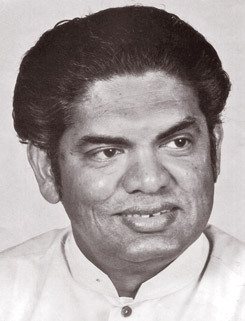 As the new Trade Minister, Lalith Athulathmudali soon after he was sworn in at the former Queen’s House pledged to end the infamous closed economy and usher an open market economy. Perhaps in his first encounter with the Press as Minister, Athulathmudali told me (the palatial room was chock-a-block with the new ministers, their families, friends, well-wishers, and, of course hangers-on, we had to talk standing) that the people had been economically sick, deprived of basic essentials, strangled by an alarming shortage of consumer goods. Long after 1977 I preserved the bread card with me as a historical memento. As the sluice gates that had kept the economy constricted burst open the market place was flooded with goods but initially the happy exercise welcomed by the consumer public was confined to the city. Not even a trickle of imported goods flowed into the rural areas and naturally people in the villages were resentful. Was the open market economy a blessing only to the town folk? Lalith Athulathmudali was quick to realize this and the concept of the Mahapola was born. Mahapola was a 'big fair' and initiated by the Trade Ministry each electorate in the backwoods would have a Mahapola once or twice a month replete with consumer goods transported from Colombo within easy access of the villagers. Mahapola was a huge success. It was called 'a super market on the move.' Villagers flocked the Mahapola not only to buy consumer articles but enjoy the variety entertainments. It was as if goods were delivered at their front doors. At the end of a week long Mahapola on the last night there were musical shows where reputed artistes performed. Mahapola also offered a political platform where Athulathmudali and others had the opportunity to address the people. Mahapola was also a popular carnival. After a long lapse rural folk were treated to some fun and entertainment. The gate fee was minimal. Brightly lit stalls put up by various departments under the ministry beckoned a people who had been starved of consumer goods for seven long years. The first tentative try-out of a Mahapola was held in the Ratmalana electorate of Lalith Athulathmudali; it was a very modest affair. Nobody knew how the new concept would work. But Athulathmudali fired by the great potential of the open market economy had a vision and the optimist he was though tempered by his pragmatism he was convinced the concept would be successful; and it did. He allowed his deputy M.S. Amarasiri to have the first fling and hold the inaugural Mahapola in his electorate in Hungama. Curious crowds thronged it and Mahapola came to be known as a national event. As the Shipping Ministry was added to his portfolio, Athulathmudali had the additional advantage of the Sri Lanka Ports Authority which he had created by the amalgamation of the Ports (Cargo) Corporation,the Ports Tally Services and the Port Commission. With every new Mahapola more and more consumer goods and services were added. Almost every electorate clamoured for a Mahapola and Athulathmudali’s hands were full. Every fortnight in his ministry he held Mahapola review meetings. For him it was a full-time job. Then somewhere in 1980 he hit upon the idea of Mahapola scholarships. There would be a Mahapola Lottery with attractive prizes and the proceeds would go into a Mahapola Scholarship Fund. Scholarships would be granted on the basis of merit (10 percent) and economic need (90 percent). In the first year 423 scholarships were granted. The rest is history. With Athulathmudali education was a passion, an obsession. He knew the rigours of poverty how poverty deprived abled, skillful children from acquiring a higher education. Mahapola Scholarships were one way of meeting that challenge; he was grateful to his parents for affording him the opportunity to reach the peak in his academic career. And very appropriately and in great filial duty he endowed a Mahapola Scholarship in memory of his parents.